*If you are looking for the basic and most commonly used Custom Fields, read this first. 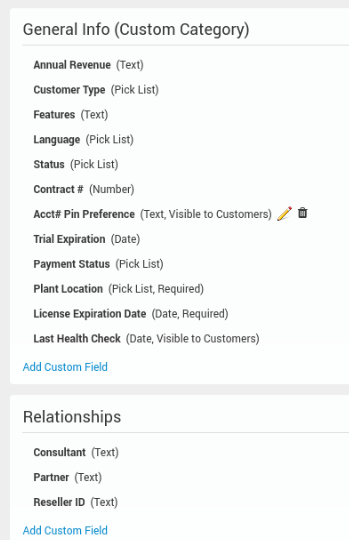 The Custom Fields section allows you to create fields unique to your organization for Tickets, Users, Products, Product Versions, Product Line, Inventory Assets, Customers, Customer Products, and Customer Contacts. Each of these different areas in the application can have as many different custom fields as you need. Quick Tip: Custom fields can be found in our Reporting section, which means you can use these fields for analyzing your data. You can also build Ticket Automation triggers with custom fields which gives you the power to automatically take action on tickets based on values that are selected in a custom field. You may also set custom field values based on other ticket conditions through Ticket Automation.
! Important note about custom fields and ticket types. It is not uncommon to place the same custom field on multiple ticket types. To do this, you need to create the field on each type separately. When you do this, it is important to make sure the name of the field is exactly the same, as well as the field type (Text, pick list, date, etc). This way, if you are on a ticket and set a value to one of these fields, if you need to change the ticket type on the ticket to something else (support to defect for example), your values will carry over on the ticket. To add/edit custom fields, go to Admin -> Custom Fields tab. First, make a selection from the “Field Type” pulldown. If you select Tickets, a second pulldown for Ticket Type will appear. To add a category, click “Add Category”. Depending on your table selection, you may have Product Line as an option. If you select a Product Line for your category, only users who have rights to the Product Line will be able to see Custom Fields within that category. You can always rearrange the custom fields into categories by dragging and dropping. You can create an unlimited number of custom fields per category and Ticket Type. This means that each separate ticket type can have custom fields which best capture the information required for that particular type. To add a custom field click “Add Custom Field”. To edit an existing custom field, hover over the name then click the pencil icon next to the name that will appear. Name: Required. This will be the name of the field displayed to the user/customer entering data in the user interface and/or Customer Hub. API Field Name: The name used for our API. This will be auto-filled after you click save. 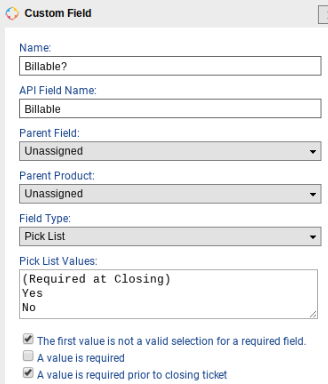 Parent Field/Parent Product: For Ticket Custom Fields, you can setup a tree of conditional custom fields using the parent field. Text: This is used when you simply want a place to enter additional text information with no restrictions unless an input mask is specified. See Input Mask description below. Number: This will only allow numbers to be entered. True of False: This is used when you want the user to enter only a true or false value. It will be presented to the user as a checkbox (checked = true, unchecked = false). Date and Time: The user will only be allowed to enter a date/time, and will be prompted with a clock and calendar dialog to help them. Date: The user will only be allowed to enter a date, and will be prompted with a calendar dialog to help them. Time: The user will only be allowed to enter a time, and will be prompted with a clock dialog to help them. Required/Mandatory fields: These boxes define if a custom field is required or mandatory for a user/customer to fill out. Description: For fields marked “visible”, when your customers hover over Custom Fields on the Customer Hub, this text will be displayed in a pop-up. For fields not “visible” this field can be used for internal informational purposes. Visible on Portal: allows you to define which of your custom fields are shown to users of your Customer Hub. When this field is enabled, the Custom Field is displayed on the New Ticket form and the values can be populated by the Hub user. This is a great way to capture necessary information from your customer during the initiation of the ticket. Additionally, the values are displayed on existing Ticket pages. You can optionally allow Hub users to modify these fields. Leaving the “Visible on Portal” flag disabled allows you to have some fields which are only displayed to internal TeamSupport users. 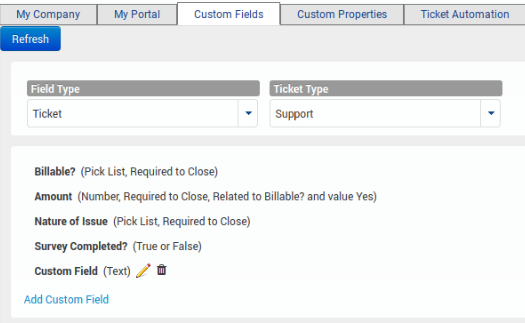 Note that the Visible flag only applies to custom fields under the “Tickets” Field Type. Please note that mandatory fields can be set for your customers on the Customer Hub. Masks: Input masks allows a user to more easily enter fixed width input where you would like them to enter the data in a certain format (dates,phone numbers, etc). Many TeamSupport customers tend to add a lot of custom fields under the Customers section. To help better organize this data, you can group fields into categories. Just click on the “add category” link, then drag/drop the custom fields where you want them to be. You can also drag/drop entire categories to reorder.